Rescuers are planning to take around 30,000 Russian citizens out of the country by air and by sea. The Russian Ministry of Emergency Situations, the Ministry of Foreign Affairs and the Ministry of Defense have prepared a plan for a large-scale operation to evacuate Russian citizens from Syria. According to the document, rescuers are ready to take around 30,000 Russians out of the dangerous region. In case of an urgent evacuation, planes from the Ministry of Emergency Situations, the Ministry of Defense and Aeroflot, as well as passenger ferries and four large navy landing vessels from the Baltic and Black Sea fleets, will take part in the operation. According to a source at the Ministry of Emergency Situations, Russians currently in Syria can be divided into three groups: “There are employees of Russian official institutions, people working in Syria under private or direct contracts, and citizens on private visits or married to locals,” the source said. He added that, in case of an aggravation of the situation in Syria, 30,000 people would need to be evacuated to Russia immediately. Only 9,000 of them are registered with the Russian Embassy and consulates, with the rest unaccounted for. However, only 402 people in the Damascus consular area and 615 more in Aleppo have officially stated a desire to leave the country. Rescue services have worked out several possible evacuation plans. The first combines land, sea and air transport: those wishing to leave will first be taken by road to the Syrian ports of Tartus and Latakia, and then ferried to Larnaca in Cyprus. Ministry planes and regularly scheduled Aeroflot and Cyprus Airways flights will then take the refugees to Russia on Airbus A320 planes, which can carry up to 180 passengers. The Russian government is also planning to use four passenger ferries for the evacuation: the Apollonia (which can carry 250 passengers), the Ant-1 (90 passengers), the Ant-2 (68 passengers) and the Nikolai Konarev (75 passengers). These ferries are currently located in the Red, Mediterranean and Black seas. 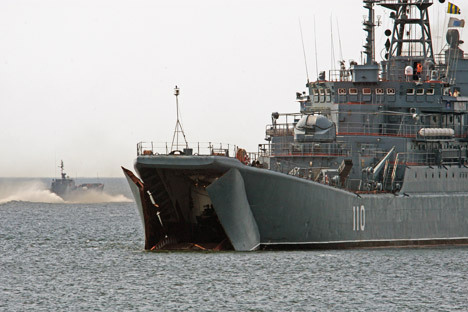 The operation will also involve patrol boats and large landing vessels from Russia’s Baltic and Black Sea fleets. According to plans, Russians will also be evacuated from the Damascus and Latakia airports on planes provided by the Ministry of Emergency Situations, Aeroflot and Transaero. Ministry of Defense military transport planes are also on a six-hour standby in Pskov, Taganrog and Orenburg. It takes eight hours to fly to Damascus, with planes crossing Ukraine, Bulgaria, Greece, Cyprus and Lebanon. Estimates suggest that four Ministry of Emergency Situations planes could take 440 people out of Syria in one go, with Aeroflot and Transaero taking around 1,400 more. Transaero stated that its Boeing 747 would not enter Syrian airspace, but would pick people up in Cyprus instead. Director of the CIS Institute, Konstantin Zatulin, believes the evacuation plan will most likely not be used. “Such operations are normally planned for real emergencies,” said Zatulin. Moreover, Russia has little experience carrying out such large-scale operations. At the end of the 1980, when ethnic strife broke out in Uzbekistan, the military brought Meskheti Turks from the former Soviet republic to Russia’s Krasnodar Territory; but the situation was different back then, Zatulin says. Around one million refugees from Kazakhstan arrived in Russia in 1994 – but they were escaping on their own, without anyone’s help. According to the source at the Ministry of Emergency Situations, a special government commission charged with coordinating interagency activities has nonetheless been set up to manage an evacuation from Syria. The total number of Ministry of Emergency Situations personnel on the ground will be 173, including crewmembers. The General Staff of the Armed Forces will decide on the number of military personnel to be deployed. The Russian Embassy in Syria reported that only two relatively safe evacuation routes remained: one via the Damascus-Beirut highway and the other from Tartus and Latakia by sea. Diplomats noted that Damascus airport was no longer safe, and it was essentially impossible to evacuate anyone from Aleppo. More than 15,000 people have been killed in Syria since fighting broke out between government troops and opponents of the Bashar al-Assad regime in March 2011. Two Russian citizens were reportedly kidnapped in Syria several days ago, and a ransom demand has already been received.